Music, theatre, art exhibitions, places to eat, sleep, drink, shop, my thoughts and recommendations. So yesterday, two of us went to the cinema to watch Wes Anderson’s new film, Moonrise Kingdom, a tale of two twelve year olds living on a tiny Island off the coast of New England. Set in the mid-1960s, the film tells the story of Suzy and Sam, two children who plan to escape the authorities and their parents and run away together. Moonrise Kingdom works tirelessly to surprise the audience throughout. Visually it is stunning, very classic and incredibly detailed whilst at the same time not being in any way ‘shiny.’ Age, at both ends of the spectrum is embraced whole heartedly. Children play at being grow ups and grown ups act like children. So, if you want to watch something slightly bizzare but beautifully original, embrace your inner adventurer and go and see this film. Friday night saw the third and final performance of Insignificant Theatre’s fifth reincarnation of The Speakeasy. 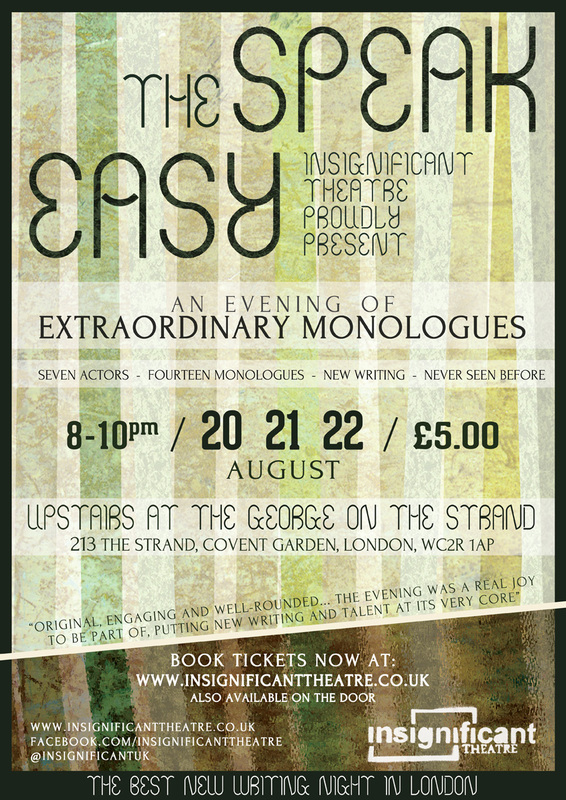 Nine actors performed sixteen new monologues to a full house in the wonderfully cosy upstairs room at The George on The Strand. The theme of the evening was quite simply ‘The City’ which was broad enough to incorporate a whole host of characters and stories whilst at the same time giving a good reference point for the audience, as with so many short stories in one evening, it would be easy for any onlooker to feel a little overwhelmed. Far from it in the case of The Speakeasy. As each actor stepped on stage a new perspective was given and it was wonderful to see ‘the city’ through so many different eyes. Many pieces chose London as the focus with various familiar characters, such as the drunken ex-husband outside the night club trying to get back to his wife, or the man on the train insisting on telling his life story to the whole carriage, provoking much laughter and knowing nods from the audience. The vast majority of the monologues presented original, engaging and well-rounded stories and those that fell a little short of the mark were still well received. Feedback forms for both actors and writers were offered at the beginning of the night but this very much lent an open and appreciative atmosphere to the evening as opposed to one of harsh criticism. The intimate setting also helped in this way with just a small, simple stage, only inches away from the audience and a beautifully detailed city-scape back drop which worked well as a reminder of the overall theme. Notable performances included Camila Fiori in ‘New York City’ by Mike Carter which captured perfectly the awkward futility so often felt at funerals, and in ‘General Catering Staff’ by Michelle Calvert, presenting a refreshingly real depiction of the woman, not climbing the career ladder but standing at the bottom of it, offering drinks and refreshments to others on their way up. Lucy Grey presented real grassroots faith in the beautifully honest and heart-warming story of ‘Foie Gras To The Sound Of Trumpets’ by Sebastian Gillies (which featured an impressively epic but mouthwatering list of lunch options from The Savoy Grill). Phil Cross put forward a nice concept of a two part monologue ‘City (Heart) Break’ which was brought to a moving conclusion by Robert Lyon, and Dan March had the whole audience singing him ‘Happy Birthday’ after a performance that was both intensely annoying and breathtakingly heartfelt in Richard Cunliffe’s ‘I’m On The Train’. The overall evening was a real joy to be a part of, putting new writing and up and coming talent at its very core. All life is here as actors get to try their hand at anything from the oddly upbeat to the mysteriously macabre and a whole lot more inbetween. Writers can see their creations brought to life on stage and audiences can actively enjoy having an opinion on what they are watching. 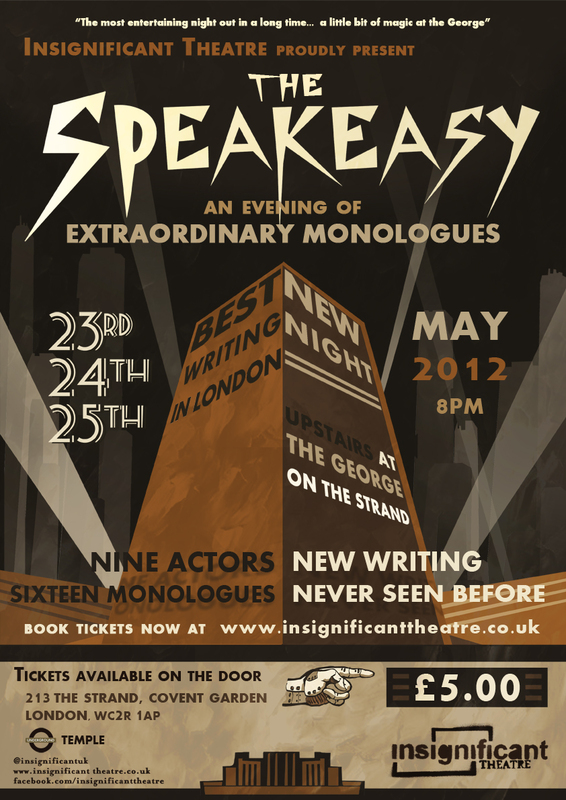 Insignificant Theatre are currently accepting submissions for the next Speakeasy, and I would strongly encourage anyone looking for a platform for their work to get involved with this innovative and welcoming creative collective. When was the last time you looked at the clouds for more than just an indication of whether or not you were going to get rained on that day? Cloud Man invites you to do just that. The fascinating sky-scape set and the mysterious, anorak-wearing woman, scribbling intently on stage as you walk into the auditorium, bids the audience’s curiosity from the off. Who is she? Why is she writing and what exactly is a Cloud Man? Written for ages four and upwards, this charmingly elaborate tale is clearly established at the beginning with a warm and quirky introduction from the piece’s highly engaging and versatile storyteller, Cloudia (Ailie Cohen), who explains that, for her, studying Cloud Men has become a life-long search. The audience are then shown an array of Cloud Man artefacts which, although beautifully put together, perhaps border on the slightly too small; not only for the tiny tots peering over the balcony to catch a glimpse of the miniature constructions but for the host of Grandmas and Grandads trying to explain throughout, to their inquisitive little ones, just exactly what is going on. This is a minor point, however, as the intricate detail of this piece is what makes it quite so magical. The delight of the main character on finding these various items is palpably infectious, prompting gasps and giggles from children throughout. The older generation too are not neglected, with moments such as the cleverly negotiated mini storm that literally happens in a tea cup, inducing a good few knowing chuckles from the more senior members of the audience. Cloud Man is touring the UK between May and August and the company have also published a book of the same title. 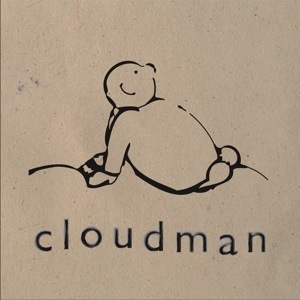 Further details about Cloud Man can be found here at http://www.cloud-man.co.uk/index.htm. For lunch today, a friend and I took the five and a half minute walk up the road from my house to one of my favourite local bolt-holes, The Chelsea Cafe. A lovely, independently run little café with locally sourced food, amazing coffee and the cheeriest welcome you could wish for. 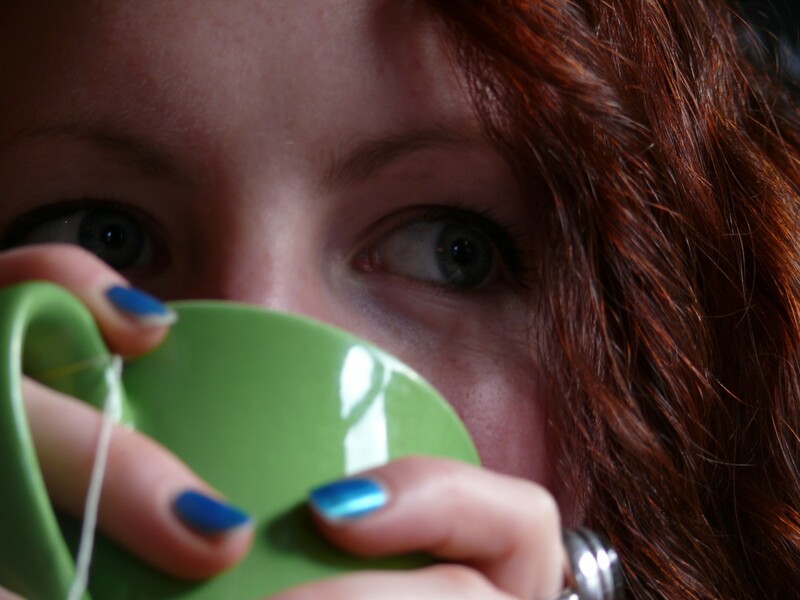 I was introduced to their impressive selection of teas, coffees and cakes a few months ago now and have whiled away many peaceful hours in there, finding myself surrounded by upturned chairs and scrubbed down, empty tables on more than one occasion. Today, however, with three hours to spare in the middle of my day, I sat down not to my usual black coffee and flapjack but to a glass of freshly squeezed orange juice and a crispy polenta and avocado salad. To me, almost anything with polenta in the title has the potential to be amazing and when it was brought over, it did indeed look extremely appetising. 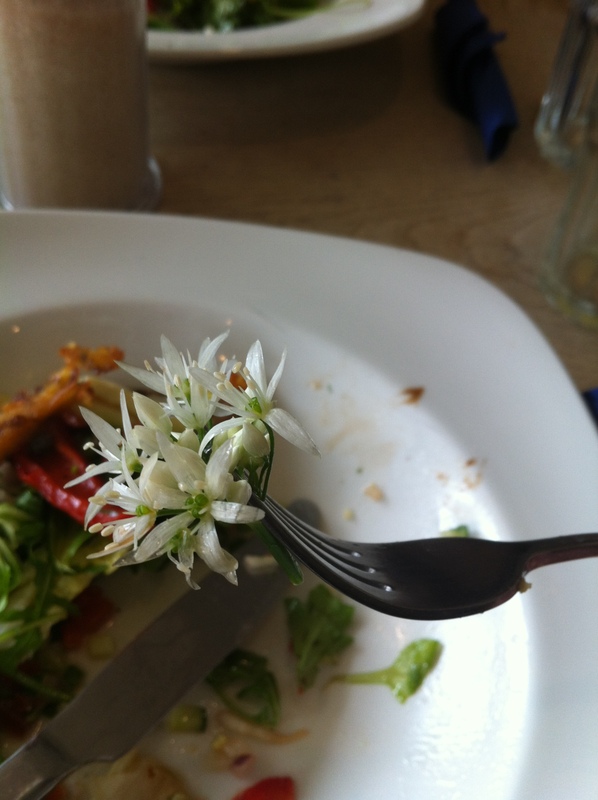 It was also beautifully garnished with a tiny sprig of wild garlic flowers that we were assured were quite edible. Don’t be fooled by their seemingly innocent appearance, these flowers can pack a punch… as my dear friend discovered after bravely, admittedly at my request, putting the entire sprig in her mouth all at once. There was also a spring vegetable soup on offer as well as a wide selection of jacket potatoes, paninis and sandwiches but I was sold on my salad. It was light and fresh with the addition of the polenta making it just that bit more filling and certainly giving it an edge over your standard plate of lunch time leafy greens. As far as coffee goes, I have been a Chelsea convert for a while now so secret, ninja salad flowers were just the icing on the cake for me. I will certainly be returning soon to see what seasonal delights the specials board has to offer in the coming months and suggest that if you like good food, great coffee and supremely smiley service, that you too should drop by.